and from my all-time favorite movie; read on! This page will touch on people and activities that mean a lot to me... maybe we have some of these things in common! I included links to the people, movies, and shows I featured here, and these links worked last time I checked them. Of course, sites come and go online all the time. I used to ask visitors to my site to let me know about any links that don't work and I would correct them. But frankly, there are a LOT of links here, and I haven't updated my cyber refuge as much in recent years and haven't had time to recheck the links. So what I will say now is, try the links for whatever interests you -- and if they no longer work, please check Google or the search engine of your choice. Thank you! First, or at least what I know always needs to be first (hasn't always been but I'm working on it...) is my relationship with Jesus Christ which began in 1976. My testimony page deals with how that came about and what it means to me, in my marriage and every aspect of life. I also share how my husband of 37 years (as of 2016), Rex, and I got together and have stayed together. F.U.R.B.A.L.L.S. 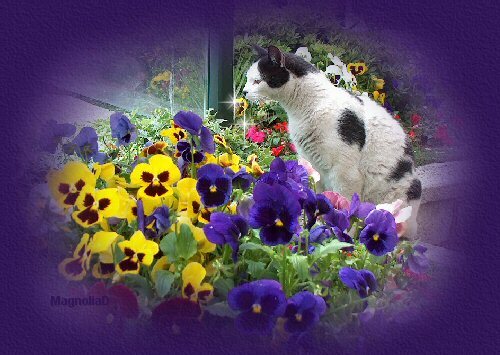 is about our "furry kids", Susie, Ty, and our dearly departed Heidi, Colby, Farley, Tessa, Gus, Archie and Jesse; along with Popeye and many other "piggies" (guinea pigs). You start with just a skein of thread or yarn and a hook and end up with an intricate-looking heirloom that was easy and relaxing to produce! It's portable, so I can do it on my 5-day-a week ferry commute! Or at home, I can work on cool, lightweight thread projects in the summer or cozy, warm yarn projects in the winter. If you are interested in having me do any custom crocheting for you, see my Comfort N'Joy (my updated crochet album) and my crochet pages on this site for pictures of some of my specialties, and E-mail me! It can't really be called a collection but I have about two dozen teddy bears! Who doesn't love teddies? I also have about a dozen and a half Barbie, Ken and Stacie dolls I've crocheted elaborate outfits for. They're kept in a glass cabinet in my computer/craft room, and will all eventually be pictured on my Comfort N'Joy crochet pages. I don't call it a collection (I think my hubby does, ha) but I have a passion for silver and white gold jewelry. My favorite gems are peridot, blue topaz, moonstone, amethyst and garnet. No "cookie cutter country" here! 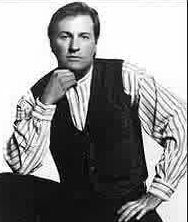 This great looking guy is Arkansas native Collin Raye. If you are not yet familiar with his music, 1) where have you been?, and 2) trust me -- you don't know what you're missing. While labeled "country", he is truly unlike any other country artist. He has ventured unafraid into such subjects as spousal abuse, alcoholism, Jesus' return into our present world, and a powerful indictment of child abuse, "The Eleventh Commandment". These "heavy" matters are balanced with sweet, poignant love songs and fun, uptempo rockers, always delivered with the same passion and the voice of an angel. This devoted father of two does NOT do "background music"; he makes you think, feel, and move into action! He also is incredible in concert; I've experienced ten of his concerts since August '98. And, oh yes, I got to meet Collin in Dec. '99, in conjunction with a project the "Internet Collinators" did for him. He spent quite awhile talking to us though it was already after midnight, and was as gracious as we had always heard. (See my pictures page.) I met him briefly a second time the following July and gave him a baby dress I'd crocheted for his new granddaughter (who, I'm very sad to report, passed away in spring '10 at the tender age of 9...). Though I feel Collin is in a league of his own when it comes to creativity, originality, and performing from the heart, there are a few other artists I would characterize in that manner, one being Clint Black. One unique thing about this man is, he co-wrote probably 98% of what he has recorded, and he is a phenomenally expressive songwriter. This Houston native is happily married to actress Lisa Hartman Black and is a dog lover (owns black Labs), making him a great guy automatically! He and Lisa became first-time parents in '02 to a baby girl, Lily. He's often asked about his resemblance to the late Roy Rogers. They recorded a duet several years ago. But they're not related! Speaking of duet partners, the pretty lady pictured here with Clint is Martina McBride. She has had hit singles since 1992, but two released in '98 impressed me enough to pick up her CD "Evolution". Still, I was not prepared for the power and beauty of the voice of this petite wife and mom from Kansas, and the quality of songs she selected to interpret. Subsequent duet partners (Jim Brickman, Bob Seger) testify to the widespread respect she has deservedly gained. I briefly met Martina in Oct. '98 and Aug.'99, and she was as nice as she is talented. It took some time, but the past few years, this multiple CMA and ACM Female Vocalist of the Year has finally received the widespread respect and recognition she so richly deserves. Over the years, I've changed the links and features on this page to reflect new favorites as well as old favorites I realized I should be including. I recently asked myself, WHY in the world am I merely mentioning the magnificent Gordon Lightfoot considering I first discovered him waay back in '72, have since acquired most of his glorious music and all these decades later, remain in awe of his unsurpassed combination of lyrics, melody and voice. If you've only heard the man's relatively few chart singles, you haven't really heard him -- each album/CD is filled with treasures that will entrall you the way they have me. Go to his discography, click on any album, any song and read the work of the poet of our times. You will long to hear the melody and voice that goes with those lyrics and will be glad you did! Back in '98-'99, when I must admit I had become a Collin Raye "groupie" and most of the other music I listened to was contemporary country, even though most of my favorite singers were professed Christians, I felt I should be listening to more music with a strong Christian message. I asked my cyber friend Judy who she could suggest. She came through by taping me two of her Ray Boltz CDs. I was quickly convinced, moved by his powerful, self-penned lyrics and soulful delivery. The CD on the left, "Allegiance" from '94, remains the most special, containing my favorite Christian song, "The Anchor Holds". But I become more impressed with this man's anointed writing and singing with each CD I hear. His ability to bring the Gospel to life will never cease to blow me away. I also occasionally listen to 50s-60s oldies, "big band", "soft rock" and have even gotten to enjoy some 70s disco! The last person I will "salute" in my music section has proven himself equally skillful in all of these styles. He has stated he feels he was born too late, as he loves 40s music. But I and countless others are grateful he's here in our generation! I have been hooked on the voice, arrangements, showmanship, and unlimited versatility of Barry Manilow from the first time I heard "I Write The Songs" in 1974. He has truly written, sung and arranged the songs that make the whole world sing! M o r e M u s i c P e o p l e . . . . Need I introduce this man and movie to any of you?! 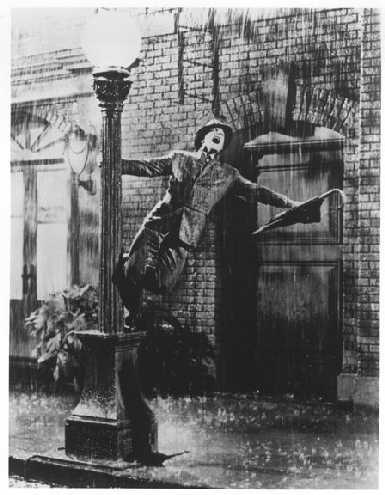 Of course, it's the pride of Pittsburgh, the one and only Gene Kelly in "Singin' in the Rain" (1952), my 2nd favorite movie he made! (My all-time favorite movie, bar none, is "An American in Paris". It contains three components unmatched before or since... Gene, Paris, and Gershwin music! To quote one of those classic Gershwin songs, "Who could ask for anything more?") This world lost Gene on Feb. 2, 1996 at age 83, and for me it was a great loss indeed. To me, he will forever remain young and vibrant as he was in the 1950s... that personality, smile, and the way he moved never to be equalled. Lest you wonder at this adulation for a man born in 1912, I am far from alone! There are at least two great websites devoted to Gene (here's the second one), largely visited by relatively young women for whom this man's memory will never be allowed to die! Here is another man who needs no introduction. I can't imagine anyone who doesn't admire the man from Indiana, PA, Jimmy Stewart. He really did lead a "Wonderful Life" and gave us all many unforgettable memories. He was a standout not only as an actor but as a human being... model husband and father, Brigadier General, poet, Presbyterian elder. There is even a museum in his hometown dedicated to him. We can all thank God that Jimmy switched from his original career plan to be an architect. His character George Bailey changed his town but Jimmy changed the world; it's a better place because he was here! Aug. 2017: I've long been aware of the fact that no 30s to 50s era actresses have been featured on my Interests page. I'm about to change that! I watch and enjoy most anything Bette Davis ever did. But the lady I've chosen to salute here has always deserved much more recognition than she gets. 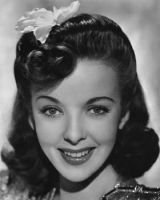 Ida Lupino starred in 59 films from 1931 to 1956. She was a great actress who never tried to be a glamour girl but was naturally pretty; I love this photo of her. In addition, she was a true pioneer, having been the first female film and television director during the 1950s, when that was virtually unheard of. Now let's go waaaaay back to the early silent film days in the 1920s. 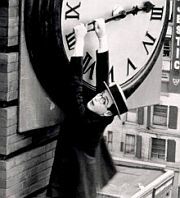 Though (I feel, unjustly) overshadowed by Chaplin and Keaton, for me, the greatest early film star of them all will always be the wonderful Harold Lloyd. 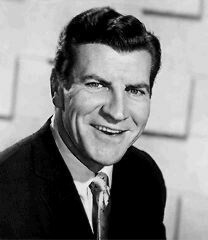 Besides being a cutie and a great comedian, Harold was known for doing all his own daredevil stunts, hanging from tall buildings many stories above the ground. (The photo shown here is from "Safety Last", 1923). This is even more remarkable considering that he lost part of his right hand in an accident in 1919! Harold passed away in 1971 at the age of 77, but he will live forever in my heart. M o r e M o v i e P e o p l e . . . . I grew up in Chicago as a baseball fan; specifically, a fan of the "heartbreak kids" a/k/a Chicago Cubs. It became harder to follow them once we moved to Seattle Mariners country in 1990. But by that time, baseball had taken a back seat to the sports I will touch on below. I still watch baseball occasionally and root each year for the long suffering "Cubbies" and M's to make it into the postseason. But as I've gotten older, I've gravitated toward faster moving sports. There may be some deep psychological meaning behind this, but let's not get into that now! Being female, it's hard to find like-minded females! This part of the country has no major speedways or tracks, so I must settle for tv coverage. Martin Truex Jr. -- Aug. 2017: Though I don't update this site a lot any more, I wanted to add a mini-salute to the NASCAR driver I cheer and root for each week now that Tony Stewart is retired. Martin, a New Jersey native and 2004-05 Xfinity Series champ, was flying under the radar till a few years ago when he started winning in the Cup series and has really caught fire this year - to the delight of the thousands of us who find him a class act, a true gentleman, an underrated talent, and quite easy on the eyes! It's looking good for MTJr. to earn his first well-deserved Cup championship in 2017; crossing fingers and toes! And also praying for full recovery for his sweet long-time girlfriend Sherry, who's been valiantly battling cancer. Tony Stewart -- I rooted for this exciting driver to win the 2002 Sprint (then Winston) Cup title, and he did! He got a lot of bad press at that time, much of which I felt was greatly exaggerated. He lost his temper a couple times, and for some time afterwards, the guy couldn't even look the wrong way at anyone. I felt he was a nice guy and just misunderstood - and it turns out I was right about that too. Tony won his second championship in '05, and everyone commented on not only his driving skill but his newfound emotional maturity. In '08 he became the driver/owner of Stewart-Haas Racing and has excelled in this new venture as well. He won his third Sprint Cup championship in 2012, cementing his place as one of the greatest ever! Johnny Benson -- The rumble you may have heard in Nov. '02 was me cheering over the LONG-awaited first Cup victory of this Michigan native, former Busch and ASA series champ, and all-around nice guy, who usually had about the worst luck possible in Winston Cup. A few years ago, he shifted over to the Truck series, which was a great decision. He became the 2008 Craftsman Truck series points champion following an exciting, nail-biting season finale. Very well deserved! Carl Edwards -- This amiable young guy is my favorite of the newer faces to come along since Winston Cup changed its name. He has proved a force to be reckoned with in both Sprint Cup and Nationwide, as well as just being fun to watch with his ever-present smile and his trademark back flip off the car roof when he wins a race, which is often. He finished a close second in both series in 2008. Kasey Kahne -- After many second-place finishes, this good-looking young man from nearby Enumclaw, Wash. started breaking through with some victories -- but not enough to make the Cup Chase (the top 12 drivers that are the only one eligible for the championship, determined 2/3rds through the season). I love the Allstate commercials with the three gals swooning over him and causing accidents in the process! Jeff Burton -- One of the steadiest veteran performers and true gentlemen in the sport. For a short while, he was up to second in the 2008 Sprint Cup standings. The general consensus among most drivers is that if they couldn't win the championship, they hoped Jeff would. He eventually finished 6th. Jeff's wife Kim seems to be at every race and her enthusiasm for her husband's success is contagious! Jamie McMurray -- This then 26-year-old from Missouri "showed me" (and thousands of other fans) near the end of 2002 when, after impressive runs in the Busch series, he took over for the injured Sterling Marlin and proceeded to decisively win his first Winston Cup race. After a long dry spell with few wins, he came back in 2010 in a big way, winning the Daytona 500 and the Brickyard 500! Robin Cousins -- The British 1980 Olympic men's champion who made me realize skating could be not only graceful but athletic and manly at the same time. He retired from pro competitions a few years ago to concentrate on choreographing, and I miss him! Paul Wylie -- People were shocked when he won the 1992 Olympic silver, but I felt Paul should have won the gold. He is THE most elegant and artistic male skater ever, and I was crushed when he retired in '98 to go back to school. Kurt Browning -- This Canadian is an absolutely wonderful and versatile entertainer who nails everything from 70s funk (the "Brickhouse" routine is a must-see) to Gene Kelly on ice (Singin' in the Rain, complete with look-alike props from the movie). He is, in my humble opinion, the greatest male skater to have not won an Olympic medal. Scott Hamilton -- I wasn't always a fan of Scott's but he won me over in recent years with his personality, innovative and often wacky routines and, more recently, the grace and unbending optimism he has displayed in his fight against cancer. Alexei Yagudin -- Wow!! There have been many judging controversies in the Olympics, but the judges got this one right; no contest! This 2002 Olympic champ and 4-time world champ from Russia, with his innovative choreography and fancy footwork (and those eyes) is definitely my favorite of the current crop of male skaters. But wouldn't you know, he's developed an injury that could cut his career short. Say it ain't so! Caryn Kadavy -- Caryn, who is now in her early 40's, remains a vision of grace and beauty on the ice unlike any other. She caught a flu bug during what was to be her Olympics; what a blow to us all! But she is doing well in pro competitions and is married to a doctor. Michelle Kwan -- It boggled my mind to see a 13-year-old girl I first watched in 1993 blossom into a lovely, expressive woman overnight. I was heartbroken to see her robbed of the Olympic gold metal in 1998, then falling short in 2002. I' wished she had tried once more for that gold. Artistry must be the deciding factor, and in that category, Michelle is unmatched. All who watch her are touched by how she "feels" the music. Kristi Yamaguchi -- Like Kurt Browning, this 1992 U.S. Olympic champion can perform in a variety of styles ranging from soft and flowing to driving and pulsating, and perform them all with equal skill and passion. Yuka Sato -- This lovely lady from Japan, the 1994 World Champion, reminds me of a beautiful flower, not only because of her effortless grace but the pure joy she exudes while performing. She has been successful in recent professional competitions not only as a solo skater, but as a pair with her husband, Jason Dungjen. As skating fans know, it is not easy to do both successfully! My other favorite sport is not appreciated by most women. I don't know why, though I didn't get into it myself till I was thirty-something! My interest in the NFL was timely since it happened the season my then-hometown team, "Da" Chicago Bears went to the Super Bowl! Yet my interest started not from the Bears, but due to starting to watch college football on the weekends when there was nothing else on, and wanting to understand what was happening. Once I got a rule book and learned what downs are (that's most of what you need to know), I started getting hooked. "Football widows", try sitting down and watching the game with your husband. You might surprise yourself -- and him! I still root for "Da Bears" though it's not the same without Coach Ditka and my all-time #1 player, Mike Singletary, who has now deservedly been inducted into the Pro Football Hall of Fame. Mike was not only a great and intense player but is a devout Christian and family man; a real role model. The Seattle Seahawks have frankly been boring for several years, despite some great trades and draft choices, till finally becoming the conference champion in the '05-'06 season. I also watch college football, and people in this area are so crazy about the Washington Huskies, it's almost like having a second pro team! Unfortunately, both they and the Hawks have had horrible seasons the past few years. This almost concludes this chronicle! I just have a few more links to share. Regarding the wonderful world of tv, of course, many of my favorite shows are the movies, sports events and music programs featuring the people noted on this page. As for other network shows, I realized while updating this page in Aug, 2010 that this section needs serious updating! I have a new favorite network series as of about 2 months ago, thanks to my best friend Dianne's mom, Margaret, who told me about N.C.I.S. (Naval Criminal Investigative Service), which I'd never seen though it has been on the air since 2003. Thank you, Margaret!! I can't say enough about this show -- the action-filled plots, the wonderful cast (especially Abby, the endearing "goth" forensic scientist, and "Ducky" --Dr. Donald Mallard, the crusty but lovable medical examiner played by veteran actor David McCallum, and then there's Tony, the womanizing agent who is easy on the eyes and knows it, and their complex, fascinating boss Gibbs, and everyone else!). The humor sprinkled throughout the dialogue despite the usually serious (albeit sometimes "tongue in cheek") subject matter is surprising and a delight. I look forward to many more years of enjoyment, since there is NO doubt this is the best show on tv today! Three other CBS crime dramas I also discovered fairly recently and have greatly enjoyed are Criminal Minds and Cold Case. CBS cancelled "Cold Case" in 2010, which is a shame. I especially liked its period episodes that flashed back and forth from the era when the crime was committed to the present day. Prior to these four great dramas, my favorite shows for several years (now also both cancelled) were the tales of the wholesome Camden family as depicted in 7th Heaven, and the entertaining and totally original "defective detective" Adrian Monk (masterfully played by Tony Shalhoub) who, despite his inner demons that kept him from being readmitted to the police force, managed every week to solve crimes that confounded everyone else. "Little People, Big World" - This reality series chronicled the everyday lives of Matt and Amy Roloff, who live on a farm in Oregon, and their four children. This doesn't sound unique till you learn that Matt and Amy are "little people" (dwarves) barely over four feet tall. One of their teenage sons is also a dwarf, but the other three kids and all four of the grandparents are average height. Their lives are strikingly similar to most any other American family and after watching their trials and joys the past few years, I almost feel I know them personally (and would like to). I admit to regularly watching and being fascinated by true crime-solving chronicles on stations such as TruTV (the former Court TV), A & E, the Biography Channel and Discovery Times. My favorites are the dean of forensics shows, Forensic Files (I couldn't believe it when I learned that the narrator, Peter Thomas, who does a wonderful job, is well into his 80s -- I would have guessed 50s!) and A & E's City Confidential, an absorbing combination of travelogue and crime chronicle. "The Wonder Years" -- I can't imagine anyone not loving and being able to relate to this charming and totally unique look back by a grown-up narrator recalling his teen and pre-teen years. "Northern Exposure" -- I immediately was attracted to the assortment of quirky characters and their lives in "Cicely, Alaska" (which was actually Roslyn, Washington, a couple hours from where we live, which we subsequently visited). I miss this show SO much. It's still rerun locally once a week. All the seasons are now out on DVD, so I will eventually treat myself. Name this tune! "Love....exciting and new....come aboard....we're expecting you!" OK, I won't quote the rest, although I could. "The Love Boat" is romantic, sweet, funny, idealistic, often silly and depicts improbable situations, but in general, an innocent escape as well as a constant reminder of how much I would love to take a cruise one day! "All in the Family" -- I saved my VERY favorite for last. Always FUNNY though I've seen them all so many times, I know in advance what Archie, Edith, Gloria and "Meathead" are going to say. Archie always reminded me a tiny bit of my dad, and Edith a tiny bit of my mom! (the friendliness, not the voice...) I was very sad when Carroll O'Connor (Archie) passed away in June 2001. As I told my hubby, "I lost my TV daddy". By all accounts, Mr. O'Connor was a gracious man and devout Catholic, nothing like the character he masterfully played.